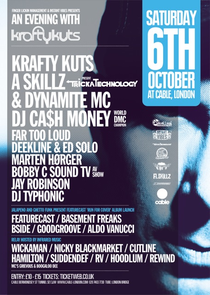 After a globetrotting, album releasing year, Krafty Kuts is back at his London home, Cable, on Saturday 6th October for the next edition of ‘An Evening With Krafty Kuts’ and this time all three club rooms will be open, increasing the capacity to 1400 ravers. Cable’s Main Room will see a plethora of award winning acts come together for one night only, and, to make sure that the room is constantly evolving, each act will have just one hour to standout from the next. 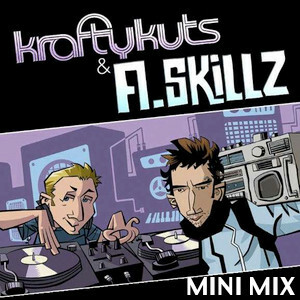 In preparation for their album’s ten-year anniversary next year, A.Skillz and Krafty Kuts will be presenting TrickaTechnology LIVE; hosted by Dynamite MC , the show will be their first ever-collaborative appearance in London. Flying in from America, the one and only DJ Cash Money will be showcasing his World DMC Champion turntablism talents and Far Too Loud will be shaking the room to a close. Next up, Deekline and Ed Solo will whip through Booty Breaks, Jungle and D&B and Marten Hørger will be making a rare UK appearance. Also playing are Bobby C Sound TV from Canada, production wizard Jay Robinson and DJ Typhonic from Australia. Room Two sees Jalapeno and Ghetto Funk celebrate the launch of Featurecast’s LP, ‘Run For Cover’. On the night, Featurecast will take charge with a headline two-hour set, Basement Freaks will be joining the party straight from Germany and rounding up the line up is South Coast star BSide, Ghetto Funks own Goodgroove and West Countries favorite DJ, AldoVanucci. Room 3 is hosted by one of the original labels of the UK bass music movement, Infrared, who will be showcasing some of the toughest sounds emerging from club culture right now. Headlining will be Infrared's own Wickaman, who will be dropping dubs from his forthcoming album collaboration with J Majik. Next up, Cutline, who are orbiting just about everywhere on the Bass Spectrum right now. Ram records’ Hamilton is also making an appearance. One of the original D&B pioneers, Nicky Blackmarket, will bring the dubs from clubs from the past 20 years. Backed up with SuddenDef, RV and Hoodlum, expect nothing but upfront bass weight thundering inside the venue. To top it off they have Hosts Boogaloo Dee, who is fresh off a summer festival tour and Infrareds late addition, Greavous.